When you get a baby, or before you deliver, all of your focus is on baby-proofing your home because you want your bundle of joy to breathe, live and crawl in a safe environment. Most parents often forget about yard proofing till the baby is three or four, or they forget about it altogether. Wrong! Outdoors can be just as dangerous for a crawling baby as any edgy interior. This is why you need to baby-proof your yard to protect your baby from outdoor hazards. Before you start yard-proofing, you need to realize that some hazards are less obvious than others which is why you need to be focused when it comes to proofing the space. We are giving you a list of potentially dangerous parts of the yard as well as some advice for you to focus on. The starting point of any child-proofing of the yard is to liberate the space of clutter. Clutter, such as old bikes, rusty pieces of tools, pieces of wood, old plastic bottles, old clothes, etc. can all be potentially dangerous for the baby. Sure, while you are holding your baby, nothing can really happen to her in terms of yard hazards, but once your adorable little thing starts crawling or running around, it's easy to get hurt on old pieces of thrown out items. It's even dangerous for grownups, let alone babies. No matter how gorgeous all those pointy monster plants may look, you now have a baby and you need to make sure there are no hazardous plants around. So, we'd suggest avoiding dangerous plants. It's best you consulted with your gardener or horticulturist for how to steer clear of dangerous plants in your yard. Steer clear of olives and berries – they are easy to choke on because they are small and their skin is pretty slippery. Also, we often advise parents to search their lawns for mushrooms every day before sending their kids out to play. Why? Believe it or not, mushrooms are one of the top plants ingested by small children. And mushrooms aren't a plant you want to joke with – they often send kids to the emergency room! 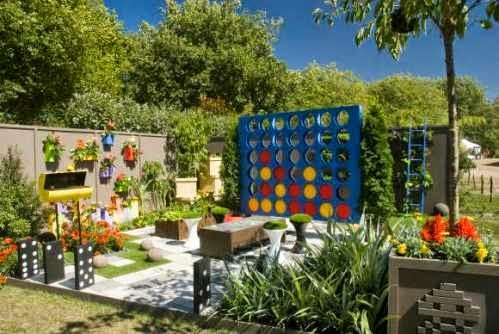 If you are big on caring for your garden, you are probably using all kinds of fertilizers and insecticides. 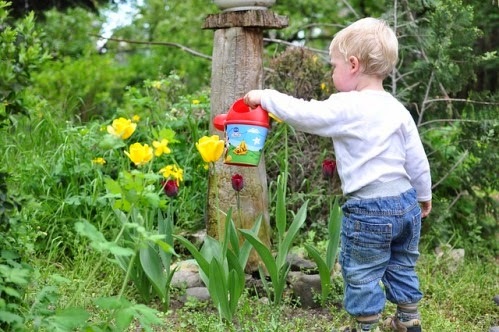 Well, before you letyour kid go out in the yard and play, confirm that all those fertilizers and insecticides are safe during application and afterward. A rather good idea is to plan more edibles than you already have (if there are any, at all). Plant more fruits, veggies and herbs. Most of them are considered nontoxic and safe for children to ingest. Growing your own fruits and vegetables has an added bonus apart from your children's safety – you'll have organic food just a few miters away from your kitchen! Not every yard has a pool, but in case you do, make sure you install a barrier to block access to them. Experts say a minimum height of 5 feet for a barrier is necessary. It needs to surround any water feature, including hot tubs, fountains and swimming pools. The barrier should be anchored to a stable base so that the kid can't knock the barrier down when playing. Make sure everything is anchored properly. Consult an expert on this. When you are creating a playground area for your baby, the ideal ground covers are soft and cushioned areas. Avoid pea gravel at all cost because these pieces are the perfect size for choking. Apart from that, they are really uncomfortable to sit on. We would always recommend grass (fake grass works, too) and padded foam. They cushion falls and are comfortable for the baby to spend time on; hard surfaces like brick and concrete are much less forgiving. Consult with experts on pavers Sydney for the best option possible. Also, if you opt for any of the three we've suggested, make sure there is a good cover blanket on the ground for the baby to sit on. Don't let it just sit or lie on the ground with no protection. Follow our guide for improved safety of your yard and make sure you implement changes in your outdoor space as soon as possible. It won't be long until your bundle of joy is running around, exploring her surroundings!